My Bosnian roots are pretty much coming out in this post. My mom has been making Bosnian food every since she could pretty much walk. 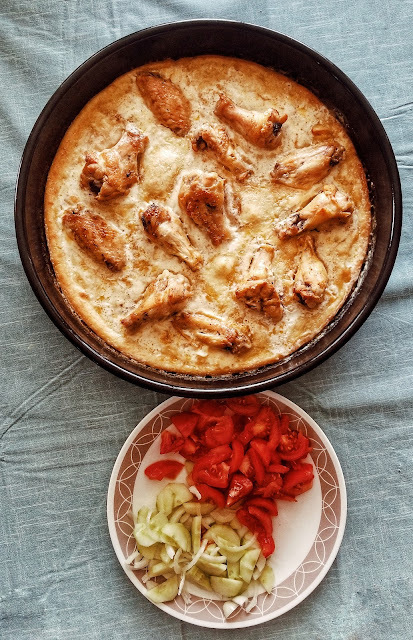 Over the years, I've had cravings for certain Bosnian foods and wanted to make them, myself. Like any other Bosnian mother, no exact measurements are used when cooking. (You think I'm joking but I'm 100% serious, they just know.) Well this is one recipe that I would like to share because I made it tonight and I thought, why not. 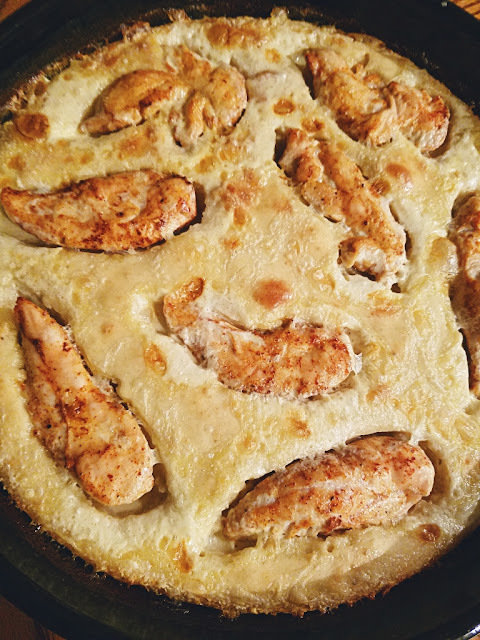 It's called Kljukusa and the best way I can describe it, is baked dough with chicken. I don't know how to exactly describe it, but oh man, it ends up being delicious. Here is what you will need: (Ingredients are not in 100% exact measurements so it might take time to perfect) Makes enough for about 4-5 people. 1 tray of chicken winglets or breasts, whatever you prefer. Seasoning for the chicken/ salt & pepper. 1. Sift your flour. You don't want chunks of it. I used my KitchenAid mixer for these next steps and poured my flour into my KitchenAid bowl. 2. Add in 3 eggs, salt, and baking powder. I let the mixer start going slowly. 6. The pan I usually use is a round 2-3 inch deep pan. I coat the bottom in oil. 7. Pour your mixture into the oiled pan and make sure it's spread evenly and there are no bubbles. 8. Take your seasoned chicken and place it wherever you'd like in the pan with the mixture. Push it down a tad so it's not floating at the top. 9. Pop it in the oven at 450 degrees for 30-35 minutes. 10. About 5 minutes before it's suppose to come out, pour some heavy whipping cream all over it. Use as much or as little as you'd like. Make sure to get the outsides so they don't end up hard. 11. Put it back in the oven for the rest of the 5 minutes.